Whether you need to replace your propane furnace or find a quick fix for your heat pump issues, the pros at Gold Star Services have you covered. When searching for experts in HVAC, Rehoboth Beach Delaware homeowners know our crew has the tools, talent, and work ethic to solve any problem. We offer a wide range of installation, maintenance, replacement, and repair services for heating, cooling, and hybrid systems. Whatever your needs, you can trust that our technicians will respond quickly and provide honest, high-quality workmanship. Call today at 302-376-7677 to schedule a home visit. Emergency Services: An unexpected heating system failure can plunge your home into a deep freeze or force you to sweat it out when the mercury spikes. Our team will respond quickly to ensure your HVAC unit is restored as quickly and efficiently as possible. Convenient Scheduling: We understand your time is valuable. Our crew will work around your schedule to ensure we don’t interrupt your life. Fair and Transparent Pricing: We will go out of our way to make sure you have an in-depth understanding of all the costs involved in replacing, repairing, maintaining, or installing your HVAC system. Advanced Tech: Cutting-edge technology enables us to diagnose and resolve HVAC issues efficiently. In fact, 92% of our calls are completed on the same visit. Consummate Professionalism: We will respect you and your home by using drop cloths and booties to ensure your space looks exactly as it did before we arrived. Never trust an inexperienced team with your heating or cooling equipment repairs, maintenance, or installation. Our professionally trained technicians will ensure your HVAC system is running at peak performance so you can enjoy the full benefits of on-demand temperature control during any season. Call 302-376-7677 today to find out more about our HVAC services. In the heat of summer or the heart of winter, you never want to face Georgetown’s extreme climes without a reliable HVAC system. When you need an expert crew to take care of HVAC installation, replacement, maintenance, or repair, make sure you choose a company with a reputation for fast response times, honest workmanship, and exceptional customer service. For everything HVAC, Georgetown DE homeowners call in the pros at Gold Star Services. We have years of experience diagnosing and repairing HVAC issues. If you’re ready to upgrade your old system, our comfort specialists will evaluate your space and budget to help you pick the right unit for your needs. Call us today at 302-376-7677 to get started. Gold Star Services offers heating maintenance, repair, replacement, and installation. Our expertly trained technicians are armed with the latest technology to diagnose your HVAC system’s issues and identify the best solution for your needs. Our team understands the importance of your time and comfort, which is why more than 92% of our calls are completed during the same visit. Our contractors will always treat your home with the utmost respect and courtesy by using drop cloths and booties to ensure they leave behind no marks, dirt, or stains. We promise your space will look exactly the same as it did when we arrived. 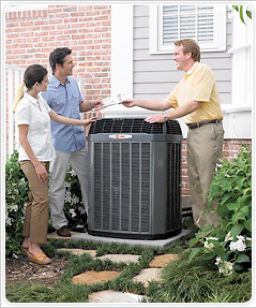 Our cooling services include air conditioner repair, maintenance, replacement, and installation. Our team of technicians has worked with a wide range of cooling systems, from ductless and split units to heat pumps. We have the technology, knowledge, and expertise to provide answers and solutions to any air conditioning questions and issues. Call Today to Discuss HVAC, Georgetown DE! Don’t be left sweating it out in summer or shivering under the covers during the colder seasons. The sooner you pick up the phone, the quicker our technicians can resolve your unresolved HVAC issues. Call 302-376-7677 today for more information, and don’t forget to ask about how our HVAC Maintenance Plans can help keep your HVAC system running smoothly year after year. Sky-high temps can be just an inconvenience if you can duck into the cool confines of your air conditioned home. But when your once-dependable A/C bites the dust and you’re left to boil over in the heat, there goes your only escape plan. In extreme heat, a broken A/C can even be dangerous to your health. At Gold Star Services, our technicians are trained to diagnose and repair common HVAC problems quickly, netting you access to life’s colder comforts. If you’re searching for help with central air conditioning problems and solutions, contact us today for assistance. Our crew will arrive promptly and figure out exactly why your air conditioner isn’t functioning properly. Call 302-376-7677 today to schedule a visit from one of our experienced HVAC technicians. Your condenser fan motor has been damaged or destroyed. Without a functioning condenser fan or motor, your A/C won’t be able to draw in and cool the indoor air. You should only trust a trained technician with the right knowledge and tools to repair or replace your condenser fan and ensure your central air conditioning system is running at optimal efficiency. Your air filter is dirty. Your air filter prevents debris from entering and damaging the vital organs of your unit. But when this filter becomes clogged, airflow through the system is restricted. You should change your filter every few months, more often if you have pets or problems with allergies. Our HVAC maintenance plan is a fuss-free way to ensure your air conditioning and heating systems are running at peak efficiency. This plan includes expert tune-ups, priority service, and bi-annual checkups. If there is noticeable ice buildup on the refrigerant line, the A/C is unable to cool your home, or you can hear a hissing noise coming from the unit, you may have a refrigerant leak. This problem requires a professional. A trained HVAC technician from Gold Star Services can diagnose and repair this issue, often during the same visit. These are just a few reasons why your central air conditioning unit may be struggling to cool your home. At Gold Star Services, we can identify the root cause of your HVAC problem, fix it, and help you avoid similar issues down the road. Call 302-376-7677 today to find out more. Why Choose Gold Star Services for HVAC – Hockessin DE? Gold Star Services is Delaware’s preferred provider of HVAC installation, maintenance, repairs, and replacement. We offer emergency services, and more than 92% of our calls are completed on the first visit. When dealing with problems related to HVAC, Hockessin DE residents turn to our team for prompt service from experienced professionals. Our skilled technicians undergo strict vetting and training procedures before they’re allowed to wear our uniform. To learn more about our services or to schedule a visit, call us today at 302-376-7677 and speak with a comfort specialist. The only thing worse than sweating it out in the summer without an A/C is bearing the frigid Delaware winter without a heating system. If your HVAC system has bitten the dust or isn’t working as efficiently as it used to, call the pros at Gold Star Services. We will use the latest technology to diagnose and fix the issue as quickly as possible. Every homeowner wants to save money, and one of the easiest ways to do so is to reduce your power bills. With a Gold Star Services HVAC Maintenance Agreement, you can rest assured that your A/C and heater will run efficiently year-round, with issues detected quickly. Performing routine maintenance will also increase the efficiency and lifespan of your HVAC system, thus reducing long-term costs. Our Maintenance Plans include expert tune-ups, bi-annual checkups, priority service, and member pricing. Contact Us Today for HVAC, Hockessin DE! When searching for a reliable service for HVAC, Hockessin DE residents know there’s only one company that always goes above and beyond customers’ expectations. Gold Star Services is ready to address all of your HVAC needs. We specialize in HVAC repair, replacement, installation, and maintenance. Our team of comfort specialists is always ready to speak with you. For more information or to learn about our specials, call us today at 302-376-7677.